First announced to the world earlier this month, AMD Malaysia today has announced that the AMD’s Never Settle: Reloaded game bundle is available in our market immediately. The bundle offers free games for new purchases of graphics cards that feature either AMD Radeon HD 7900 or 7800 GPU series. There are three games involved in the bundle – namely BioShock Infinite, Crysis 3 and DmC: Devil May Cry – although customers will only receive a combination of two games for each purchase depending on their choice of GPU series. A combination of BioShock Infinite and Crysis 3 are given alongside Radeon HD 7900 series cards while the Radeon HD 7800 series cards receive BioShock Infinite and DmC: Devil May Cry. Since customers will receive a redemption coupon alongside their purchase, they are advised to contact their favorite retailers to ask about the program beforehand. 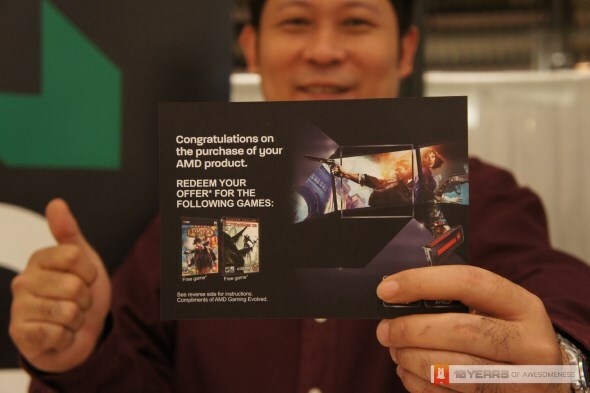 Alternatively, customers may contact AMD Malaysia through the company’s official Facebook page if they didn’t receive the redemption code with their graphics card as long as the customers are able to provide valid proof of purchase. That being said, the AMD Never Settle: Reloaded Bundle Program is still subject to stocks availability. To learn more, visit www.amd.com or connect directly with AMD Malaysia through facebook.com/amdmalaysia.